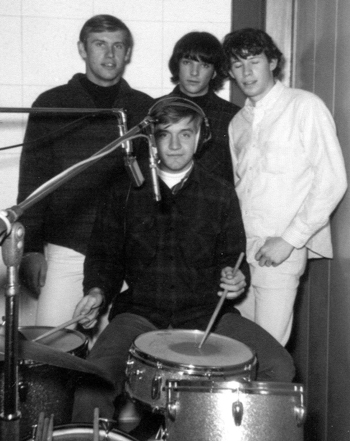 It was 1966 when four 19-year-old Stout State University students formed The Benders, a rock ‘n’ roll group influenced by Chuck Berry and The Rolling Stones. The group received moderate local success and recorded their only 45-rpm single titled “Can’t Tame Me” before disbanding. Although the single was nothing more than a local hit at the time, now—48 years later—it is considered a highly sought after item for music collectors. Around campus, The Benders were like John, Paul, George and Ringo, only their names were Tom, Paul, Gerry and Geno. The group performed at local bars and frat parties at a time when rock ‘n’ roll was huge nationwide. Top acts from that time included The Monkees, Tommy James and the Shondells and The Beach Boys. “Can’t Tame Me” was recorded at Duke Wright Studios in Wausau, Wis. and was released on the Big Sound label. “Paul, Geno and I just threw the song together as our idea of what we thought a rock song should sound like. Just having fun jamming as young college dudes,” said lead guitarist Gerry Cain. Now the single is considered to be highly collectible. In fact, one copy of the several hundred originals that were printed in 1966 sold for nearly $2,000 online. One collector in particular ranked the “Can’t Tame Me” single 87th on the list of 1,000 rarest U.S. 1960s garage 45-rpm singles and estimated that there are only 20 existing copies of the record today. Paul Barry and Gerry Cain are both amused and astonished by the delayed response to the single. In lieu of their single’s success, The Benders reunited in the summer of 2013 at Barry’s home in Watertown, Wis.
“We swapped old stories of our Stout days, jammed and even went into the studio to record,” Barry said. Recording as a trio due to the loss of Tom Noffke, they put together a CD that featured a re-recorded version of “Can’t Tame Me,” two new original records and the original recording of “Can’t Tame Me” along with its original B-side, “Got me Down.” The CD was released last fall. “We made the jacket of the CD and the CD itself look as close as possible to the original record and sleeve. So the whole package looks like a miniature 45,” Barry added. To listen to the original recording of “Can’t Tame Me” search “The Benders Can’t Tame Me” on YouTube.